When you dial 911 during an emergency every second counts. Unfortunately, precious minutes are often wasted as emergency personnel try to locate the correct house especially at night. In urban areas, houses are often close together and poorly marked, while in rural settings, they are often isolated and inadequately lit. The Xenon flashing strobe light is visible for thousands of feet, saving rescuers precious seconds finding your location. With the emergency help light you simply press the suction cup against a window facing the road, and turn on the switch. The lamps used, are similar to those used in police and emergency vehicles because of their intense brightness and extremely long life ( over 1,000,000 Flashes ). Gives you peace of mind when you need it most. 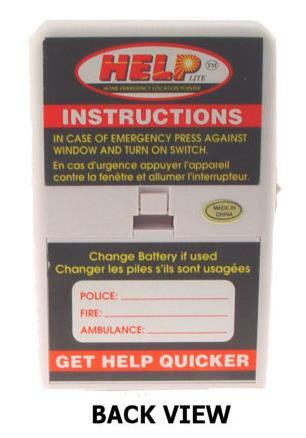 The emergency help light is battery operated (Requires 2 AA batteries not included) which makes this item ideal for boaters, hunters, hikers, snowmobiliers, skiers, campers and woodsmen. Dimensions are 4-1/4" x 2-5/8" x 1-1/8".